In this tutorial I will give an overview of the Integrated Development Environment (IDE).The IDE is used to create, develop and maintain your Visual Prolog projects. 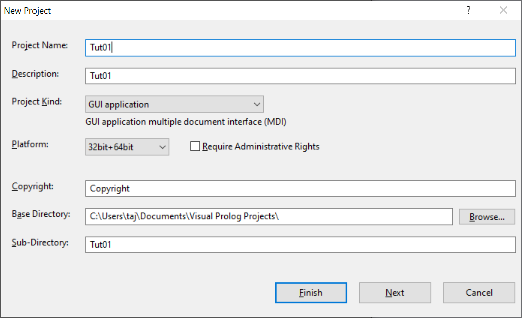 The project is created in the IDE, at creation time you choose important properties of your project, such as whether the project is an executable or a DLL, whether it uses GUI or is text based, etc. The project is built, i.e. compiled and linked, from the IDE. The IDE and the compiler collect information about the project, which is utilized in various ways for quick localization of entities, etc. During the development and maintenance of the project, the IDE is used to add and remove source files and GUI entities to the project and to edit these. 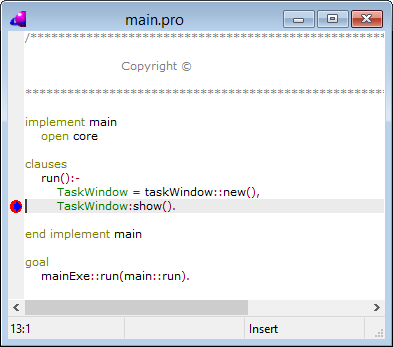 The IDE is also used for debugging the project. The debugger is used to follow program execution and exploit the program state when the program runs.In the sequel we will look more detailed at each of these things. Notice that the tutorial will start from scratch and create a project that is used for the whole tutorial. The reader is encouraged to do the same. Also notice that clicking on reduced pictures will show them in full scale in a separate window. First we will create a project by selecting Project -> New... in the menu. In response to this you are presented to a dialog containing various properties of the project. 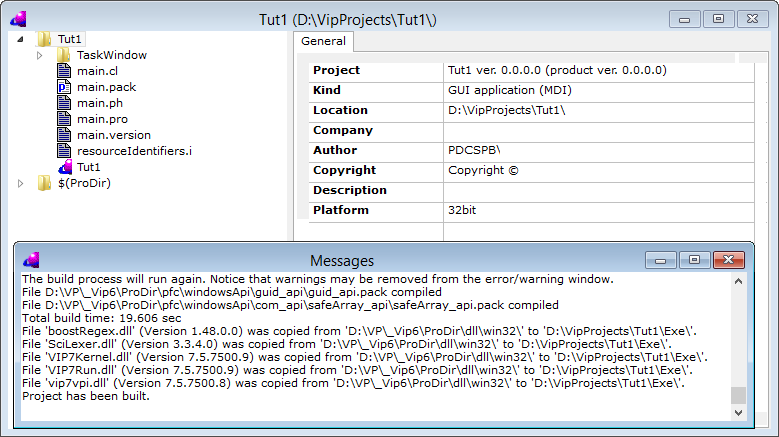 I have chosen that my project should have the name tut01. The project name is also used as the name of the target that is produced. In this case the target is an exe file so the target name will be tut01.exe. I have also chosen that the target should be a GUI program, i.e. 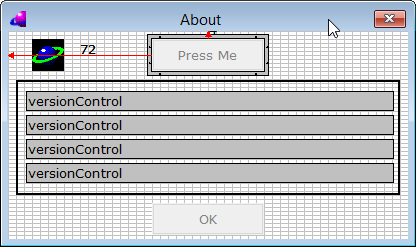 a program with a graphical user interface. The Base Directory is the "base" of all your projects; you should choose a place that is convenient for you. The new project will be created in a Sub-Directory of the base directory. By default this directory have the same name as the project itself. The Package Prefix is used when creating new "packages" in the system (a later tutorial will explain about the package notion). In case your source files will ever be shared with somebody else it is a good idea if the prefix does not conflict with other prefixes. Therefore it is a good idea to use a prefix that start with a reverse Internet domain name, like com/visual-prolog (which is the reverse of visual-prolog.com). For the moment you do not need to consider the remaining tabs and options. Now create the project by pressing OK.
You have the Project Window, which contains information about the entities in your project. You have the Messages Window, which will contain various status and progress messages. Before we make any modifications, we will build (i.e. compile and link) the project. In the Build menu you find commands for building, compiling and executing the project. If you choose Execute the project is first build, so that it is an up to date version you execute. Therefore I will choose Execute. If you have not registered Visual Prolog you will be presented to a special screen telling you so. I will suggest that you register, but you can also choose "Continue Evaluation". In the Messages Window the IDE writes which files are compiled, etc. If the build process succeeds, which it does in this case, the created program is executed. As a result you will see a little doing-nothing GUI program. You might notice that the program looks a bit like the IDE itself. This is no coincidence since the IDE is actually a Visual Prolog program. Later in this tutorial we will also see what happens, if the compiler or the linker detects errors in the build process. Right now we will turn our eyes to the Project Tree in the Project Window, and explore that a bit. The tree itself is presented in a standard Windows tree control so you should already be familiar with its usage. Here we shall concentrate on the contents of the tree. The top node represents the project, and the project directory. Right below that is the logical node $(ProDir) which represents the directory in which Visual Prolog is installed. This directory contains (as we shall shortly see) libraries and library code from the Visual Prolog system. Then comes another directory TaskWindow, which is a subdirectory of the project directory. 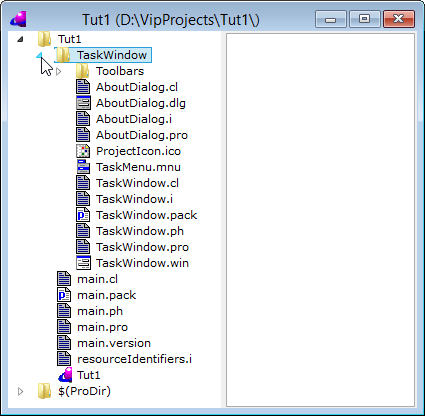 This directory contains all the code needed to produce the Task Window, its menu and toolbar and the about dialog. .ph files are package headers. A package is a collection of classes and interfaces that are intended to be used as a chunk. .pack files are packages. They contain the implementation/definition of the corresponding .ph files. .i file contains an interface. This sub-tree shows that the file main.cl contains a class called main, which contains the declaration of the predicate run. Predicates are subroutines, but they will not be considered further in this tutorial. If you right click on a node a context menu will appear, with commands that have relevance for that particular node. If you double click on a node the corresponding entity will be brought up in a suitable editor. All code is edited in a text editor, but windows resources like dialogs and menus are edited in graphical editors. We will look closer to graphical editors below, here we shall try to bring up a text editor. Try double clicking on each of the run nodes, and notice that two editors open showing the declaration and the definition of the run predicate, respectively. The IDE has other facilities for browsing to specific entities, but these will not be considered here. Now lets try to modify the project a bit. Since we have not yet concerned ourselves with how to program in Visual Prolog, we will keep the changes simple. We will start by deliberately introducing an error, that way you will not be completely surprised if you make some thing wrong, at the same time you can see the error window. We will not consider what the error message actually means. Instead you should try to double-click on the error message. You will notice that the editor gets focus again and that the caret points exactly to the fail we inserted. Reestablish the code without the fail and build the project again. Next we will try to make a modification in the about dialog. It is not a very sensible change, but it will illustrate a number of things. 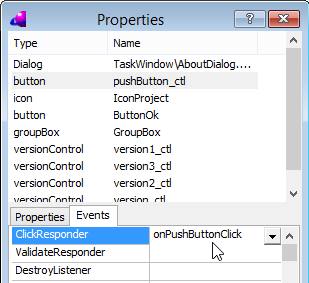 Once you have clicked it you will see the dialog in the Dialog Editor, two toolbars and properties window. We will add a button to the dialog. 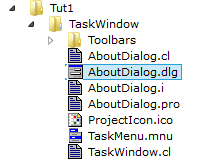 You click on the "button" on the controls toolbar, and then you click in the dialog next to the project icon in the AboutDialog window. As a result you can see the properties of the new control and you can edit them. 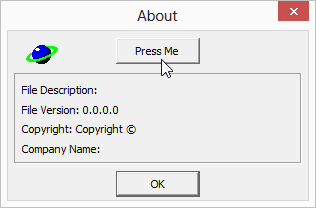 I have changed the Text to "Press Me", this is the text that will appear on the button. I can also see the Name field, the IDE will identify this particular control in various contexts by this Name. The IDE has suggested the name onPushButton for the handling predicate. If you double-click the line corresponding to the event, an editor will open positioned at the newly inserted code. Now try to build and execute the program again (i.e. press the Ctrl+Shift+B key combination). If you have followed the steps carefully this should be a success. In the program you should of course open the About dialog, by selecting the menu entry Help -> About; and then press the new button. The development environment contains a debugger. With the debugger you can trace the execution of your program and examine the program state. It does not make much sense to go into details with debugging before you have learned the Visual Prolog language. But I will briefly explain the debugger anyway, because it can be very useful for understanding and experimenting with the language. To start the debugger, select Debug -> Run in the menu. If the project is not up-to-date it will first be build, after that the debugging session will start. Notice you can stop the debugging at any time by selecting Debug -> Stop Debugging in the menu. You can single step in the program using the Step Into and Step Over commands in the Debug menu. Try Step Into: this will open another editor with the code of mainExe::run, and the arrow will point to the entry of this code. 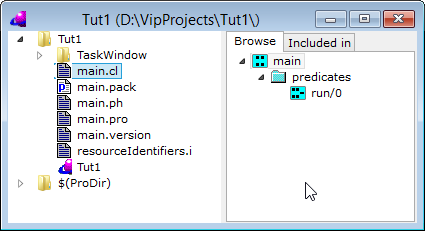 In the view menu you can open various debugger windows, which I will briefly explain. contains a "picture" of the run stack. In principle, the run stack contains a number of lines corresponding to calls that has been made. However, optimization (so called last call optimization) might have removed some entries. The run stack not only shows the calls, it also shows trap points and backtrack points, these is described in a later tutorial and there I also describe the run stack window in more details. 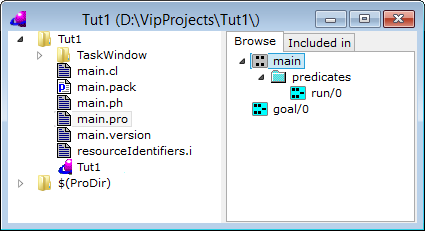 contains the local variables corresponding to the selection in the run stack window. Some variables might not yet have received a value, these are show as an underscore (i.e. like originalraiser in the above picture). Contains the global state of the program, this state is stored in fact databases. Fact databases are a unique Visual Prolog feature, which will be described in a later tutorial. You can also add objects from the Local Variables window to the Facts window, that way you can track the state changes in interesting objects. 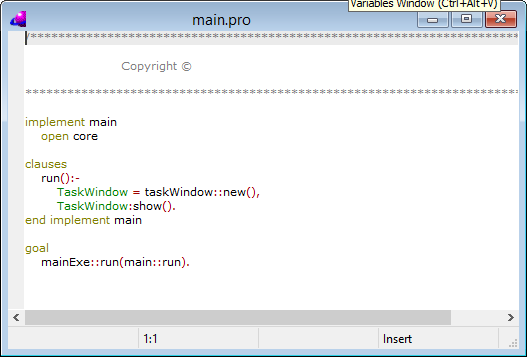 shows the current breakpoints in the program (I have set open breakpoint so that the window would not be empty). You can set/remove breakpoints by selecting Debug -> Toggle Breakpoint. The remaining debug windows are for low level debugging and will not be considered here. your projects. It contains a number of tools, editor and wizards that will help you in your tasks. This page was last edited on 2 June 2017, at 14:30.